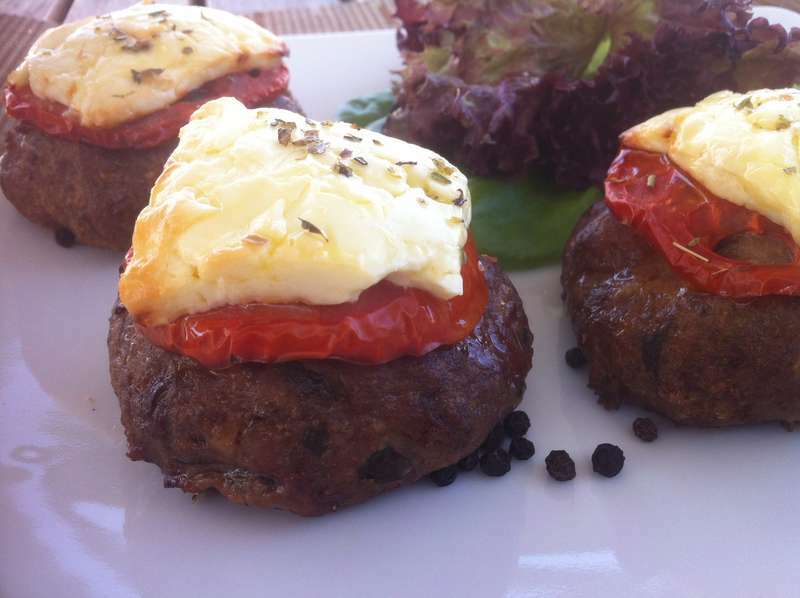 Bifteki recipe (Greek burgers) – A Mediterranean twist to your plate! Greek bifteki (burgers) with spicy feta cheese and juicy tomato topping! Juicy and well seasoned minced meat, infused with the aromas and flavors of parsley, garlic, onions and oregano, garnished with salty feta cheese and tomatoes.. Well, one couldn’t ask for more! Except for that Greek salad aside. So, if you’re tired of the same old beef burgers recipes, give this Greek bifteki recipe a try and mix things up, adding a Mediterranean twist to your plate! Some people, prefer their burgers neat, but Greeks enhance the flavor of their burgers (bifteki) with fresh herbs, like oregano, spearmint and parsley, which give a unique taste. The key, of course, is to get some good-quality grounded meat and I always find it better to mix things up using both minced beef and pork or lamb, for extra flavor. For the topping, use some spicy feta cheese and ripe tomatoes and finish with a drizzle of extra virgin olive oil. Feta and tomatoes, not only add a Mediterranean twist to these Greek burgers, but also provide moisture and unique texture. And if that’s not enough, go over the top and garnish with a full spoon of cooling tzatziki sauce! Enjoy with some pita breads aside. Greek bifteki owes its unique flavour and taste to the seasoning and herbs. But sometimes the bifteki can become a little bit heavy. To avoid this, a little trick is to sauté the onions and garlic before adding them in the ground meat mixture, so that the aromas are more gentle and discreet. Traditionally, biftekia have a different texture than common burgers. For the perfect burgers, the meat mixture shouldn’t be overworked so that they remain fluffy. However Greek bifteki is more firm, but still juicy, as the mixture is worked by hand or electric mixer until the herbs and spices penetrate the meat. For this Greek bifteki recipe you can either go with beef or a combination of beef and pork or lamb (a little fat is necessary for extra flavour!). During the end of cooking time top with feta cheese and slices of tomatoes. Let the feta cheese soften enough to make a smooth, creamy topping. Another very popular way to make Greek bifteki is to stuff it with feta cheese instead of topping it, so feel free to go either way (click here for recipe>>). Of course the best option is to grill the bifteki on a char-coal barbecue, to get them all crunchy and smokey. However they also work great on a grill pan or in the oven, if you don’t have the time or space for a proper barbecue. Enjoy! Oh and you can always read this delicious recipe in Greek here Ζουμερά Μπιφτέκια στο φούρνο Συνταγή. To prepare this Greek bifteki recipe, add in a large bowl the minced beef along with the rest of the ingredients and mix thoroughly with your hands. If the mixture is too sticky add some more breadcrumbs (or some water if it is to dry), till the mix is solid. If you have the time, it is better to knead the mixture for about 10 minutes, until all the ingredients combine. Alternatively, you can mix it using an electric mixer, with the dough hook at low speed. When done, put the mixture for the burgers (bifteki) in the fridge to rest for about 10 minutes, whilst preheating the oven to 200C. Knead the mixture in flat round burgers. Place the biftekia on a large baking tray and cook in the oven for 18 minutes, flipping the burgers, mid-through cooking time. Top each bifteki with a slice of tomato and a small block of feta cheese and bake further for 7 minutes.